Another of the long thin tags for Di's outing to Hochanda last December. I love mixing up vintage with mixed media techniques and effects. 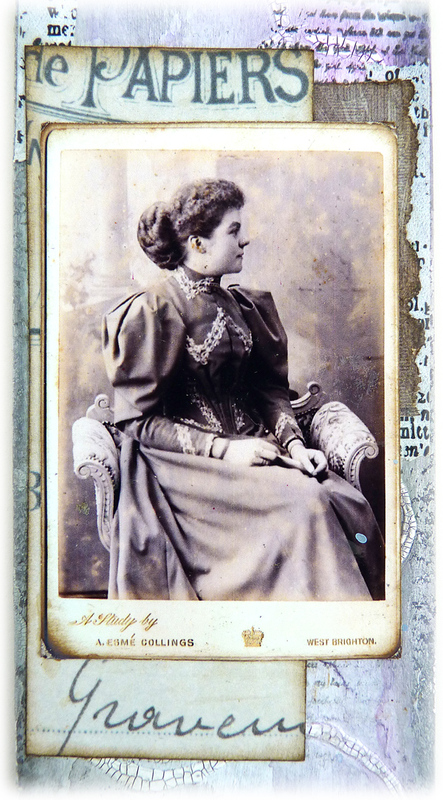 First I found the photo for this tag which is from my own collection of old cabinet cards. So we have some dip, drip and dry and crackle circles in the background and then some vintage feel with the collage and colours. It fits the bill methinks. I've saved this tag to fit the new theme over on the Tando blog this week which is called Photo Booth. 1. Seal substrate with light coat of gesso. 2. Stencil circles using white crackle paint and leave to dry naturally. 3. Dip, drip, daub, spritz and dry with watery washes of fluid media acrylics. I used quinacridone violet, dioxazine purple, dark grey value 3 and translucent white. 4. Stamp using watering can archival inks. 5. Blend watering can around the edges. 6. Tear and add some small pieces of tissue tape. 7. 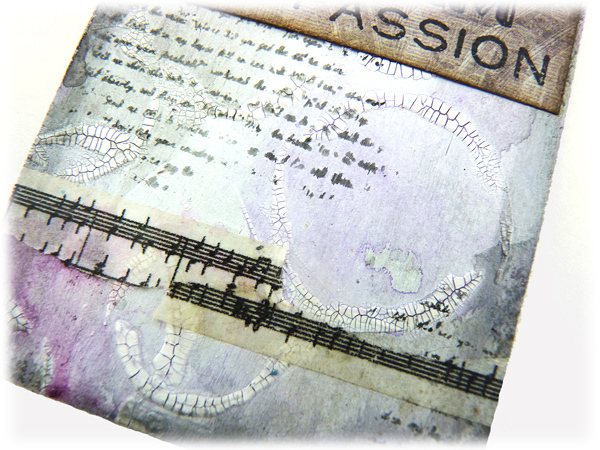 Gather some small pieces of ephemera for using as a layered collage. 8. Find a vintage brad for the tag hole. 9. Cut and mount a heritage photo and add it to the collage layers. 10. Add some pertinent words or a phrase. You don't need many bits of paper/ephemera to create a collage. I think three pieces was just enough here. I stamped the sentiment onto patterned paper and coloured part of it in with a purple distress marker. I'm thinking now that I could have added even more detail by altering the vintage brad, maybe painted it or rubbed over some metallic lustre. Torn Tissue tape adds a lovely detail. Two pieces placed like this creates an uneven line across the surface making your eye move around more at the bottom of the tag. The crackles really pop on the circles with the dark paints showing through them. 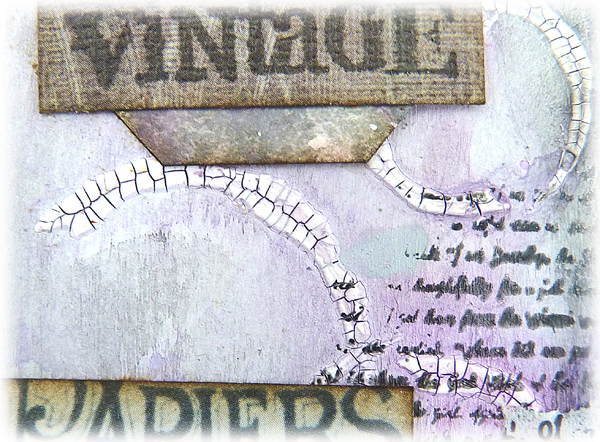 This was the second in a series of three of these tags made for Di for one of her Hochanda outings. You may have seen the others but if you missed them they can be found Here and Here. Big applaude - this is so beautiful! 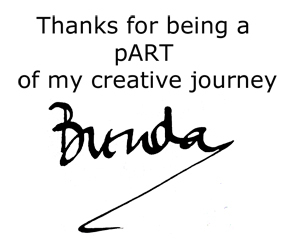 Happy new week Brenda! A gorgeous vintage tag, great details as always. What a gorgeous tag, I love everything about it. 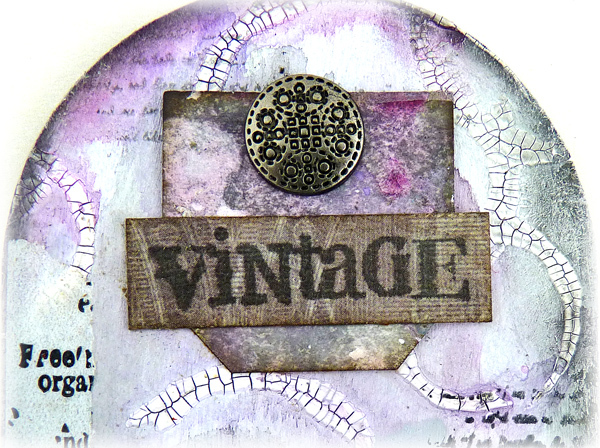 A beautiful tag Brenda, it's a fabulous background for your vintage photo. The beauty of these creations is that we can always go back over and add more Brenda, even after time they just seem to grow more fabulous with age. I love how you have used a system of events, reminds me of a process I was taught in a group a few years ago when I used FB. I must seek it out again as it's so useful to have a prompt at times. Beautiful make. Lovely, soft, romantic colours, perfect with the vintage photo. Such a pretty tall tag.